I was offered this book by a publicist who found my blog, probably through some other review campaign, and I leaped at it, because I read Sheila Weller’s previous book Girls Like Us (about women in music) and loved it. I’ve also interviewed her for All Things Girl so, I sort of knew what to expect. Weller takes us through the lives of three women at the forefront of news media – Christiane Amanpour, Katie Couric, and Diane Sawyer – weaving them in and out of each other, and letting us see them as girls, as women, as people, as the faces of the news. I enjoyed learning more about these women, all of whom I’ve watched since forever, and I also enjoyed Weller’s narrative style. She makes biography read like a novel, and is always candid but seems to make an effort to do so from a place of kindness. You can tell that she may not always agree with her subjects, but she always respects them. 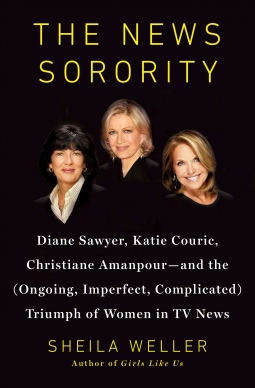 If you want to feel as if you truly know these women, read this book. You’ll laugh, you’ll cry, and you’ll never look at television journalism the same way again.